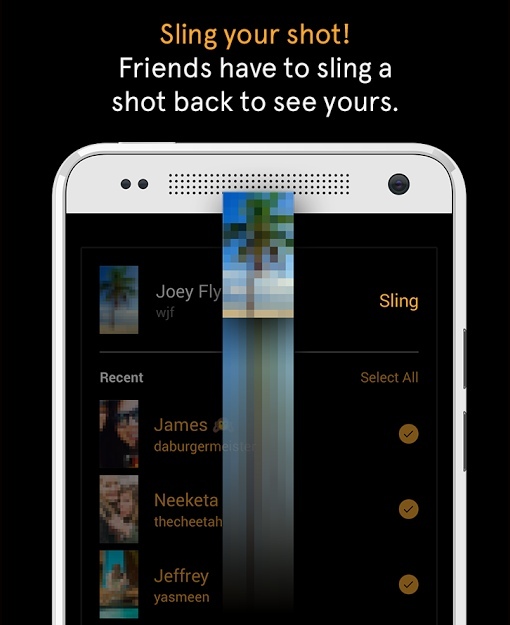 Facebook launched a new app today called Slingshot, a Snapchat competitor that requires you to share pictures with your friends before you can receive them in return. Indeed, with the Slingshot app, participation is mandatory. People won’t be able to see pictures and video you’ve sent them until they send you something back – kind of like a heavy-handed pen pal program. As with Snapchat, you can add text and color drawings to photos. Photos and videos are sent only to those people you specify, and are automatically deleted after their recipients view them. Slingshot is an interesting idea, but not all interesting ideas make for worthwhile apps. I love getting pics from my friends and family when they’re out doing something interesting or having fun. What I don’t love is being required to send them a picture of my own dopey face in return, proving I’m just sitting alone on my couch eating ice cream on a Saturday evening. Some nights are just made for spectating, you know? Of course, since the new photo and video sharing app is free, there’s no harm in giving Slingshot a try if the concept sounds fun and interesting. You can download the app for iOS and Android at sling.me/download.